Today sees the formal launch of Lemon, a free cloud-based receipt organizer and spending tracker for Android and iOS devices (Blackberry and Windows Phone versions ‘coming soon’). The service lets users store and organize email and paper receipts in the cloud to help them keep track of purchases, eliminate clutter and start spending smarter. To upload paper receipts, people can download a mobile app and simply snap a picture of the receipt. Lemon will subsequently digitize and store the data. 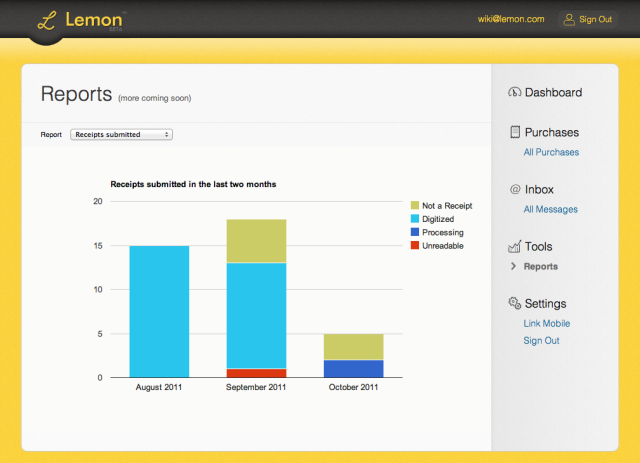 Digital receipts – from any retailer, the fledgling company claims – can be sent directly to one’s Lemon account (which comes with a personal @lemon.com email address). Lemon squeezes out all the juicy details [receipts] contain to help you stay organized, see where your money goes and save some cash along the way. Lemon extracts data from each receipt down to the product-level detail to generate insightful reports andgraphs that illustrate spending trends, make it easy to prepare for tax time or submit expense reports. Over time, Lemon will also offer users targeted discounts and promotions from relevant brands and retailers based on their spending habits, giving users access to exclusive deals, future discounts on products they purchase often and personalized offers from their favorite brands. Lemon was co-founded by co-CEO Wenceslao Casares, serial entrepreneur (Bling Nation, MECK, Wanako Games) and angel investor (Qik, IndexTank, MyGengo). The company has already secured $10 million+ in funding from Lightspeed and Balderton Capital. 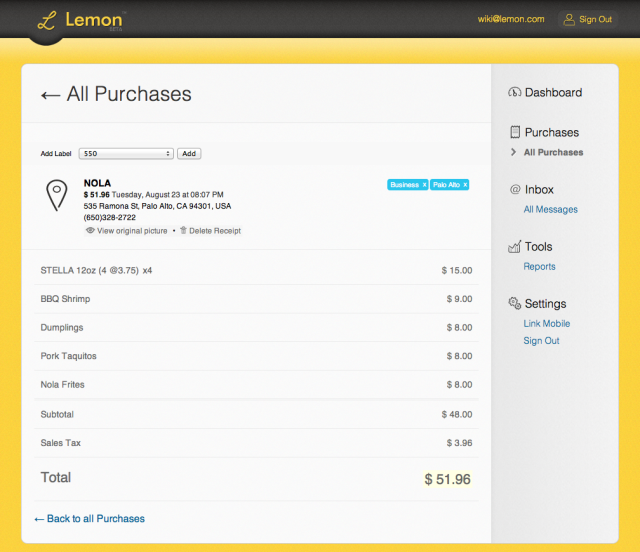 Lemon soft-launched at the most recent TechCrunch Disrupt conference’s startup alley. For similar services, check out Shoeboxed, MyReceipts, Expensify and KEEBO. UPDATE 2/12: Lemon.com informs us that the $10M+ was for their previous company, Bling Nation. Lemon is currently bootstrapped.